By Robert B. Martin, Jr. Allow me to introduce you to a rose of my own creation, a miniflora rose with hybrid tea form that I named 'Butter Cream'. 'Butter Cream' ('MARButter') is a cross of 'Anne Morrow Lindbergh' x 'Fairhope'. 'Anne Morrow Lindbergh' is a hybrid tea rose of undisclosed breeding that was also the seed parent of the superb exhibition rose and AARS winner, 'Gemini'. 'Fairhope' is a miniature rose that was the top-rated miniature exhibition rose in the country for eleven consecutive years through 2006 . 'Butter Cream' has many similarities to 'Fairhope', however the blooms are a clean medium butter yellow and much larger (about 2-inches), marking it a true miniflora. The classic form is extraordinary and more high-centered than 'Fairhope', a trait it appears to have taken from its seed parent, 'Anne Morrow Lindbergh'. The blooms typically have about 28-32 petals. The yellow blossom is more prominent in cooler, overcast weather and shaded conditions; in hot sunny conditions the blooms tend to be whiter. The blooms appear one to a stem and have excellent substance, lasting a long time on the bush and as a cut flower. 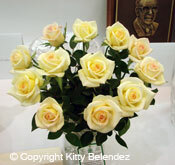 The rosebush itself is upright, tall (30-inches), with medium green, semi-glossy, highly disease-resistant foliage. It is very vigorous and grows well on its own roots, producing show-quality blooms at an early age. The exceptional quality of the bush, and particularly its disease resistance, has lead Ping Lim to use in his breeding program that focuses on disease resistant varieties. 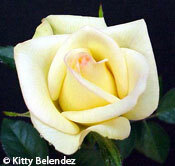 'Butter Cream' was, however, bred primarily to be a show contender and has not disappointed. In its first appearance on the show tables, it won the seedling class at the San Jose Spring National in April, 2002. 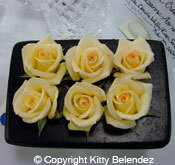 Following its commercial introduction by Rosemania in 2003 it recorded its first Queen at the Gainesville Rose Society show in Florida on April 26, 2003, shown by Steve Felts of Ocala, FL. This was also the first Queen of Show for him and came with the second bloom on a plant he had received in March. As of this writing 'Butter Cream' has won 60 Queens nationally and in 2008 was the No. 2 ranked show miniflora in the nation. It has also demonstrated an ability to produce show-quality sprays, ranking No. 1 in that category in 2008. In addition to its show quality, the prospect of attractive good-sized blooms on a vigorous, disease resistant plant suggests that 'Butter Cream' can be put to many garden uses. In all, it's a rose that I am very proud of and think you will be too. © Copyright Robert B. Martin, Jr. All rights reserved. © Copyright Pacific Rose Society. All rights reserved.